ePublishing Knowledge BaseePublishing Knowledge BaseePublishing Knowledge Base Creating, Managing, and Selling Products I've reviewed a failed order. How do I grant the customer access to what they bought? Your team has reviewed a customer's failed order and addressed the question of payment offline. Now you need to make sure the items the customer ordered are fulfilled. Use your company's standard process for fulfilling orders of products that you ship, such as books, DVDs, physical reports and so on. Daily export of orders from the Order Manager. Automated processes that may be in place to report new or updated orders to a batch file and sent to third-party fulfillment houses. If you have questions about this, please contact your project manager. If the customer purchased online-only access to a specific paid article, paid newsletter issue, paid video, paid audio file, or paid downloadable file, the reader will NOT be granted access if the order transaction fails. Access to these types of products must be completed online in that reader's account while logged-in on the website. When the customer's alternate form of payment clears offline, use a corporate card while logged in as that reader on the front end of your website to recreate the order for them. This requires you or your customer service rep to first change the reader's password in your Admin so that you can access their account. Ask the reader to change their password after the transaction. If your customer bought a ticket or multiple tickets to an event, but the order failed, you'll need to manually add them to the event's attendees list. Find the event attendees list in your Event in the Event Manager under Edit > Attendance. Update event attendees under either Batch Update or through the Add an Attendee icon. Learn how to manually add a subscription to a reader's profile in this article: How do I add a subscription to a reader's profile? 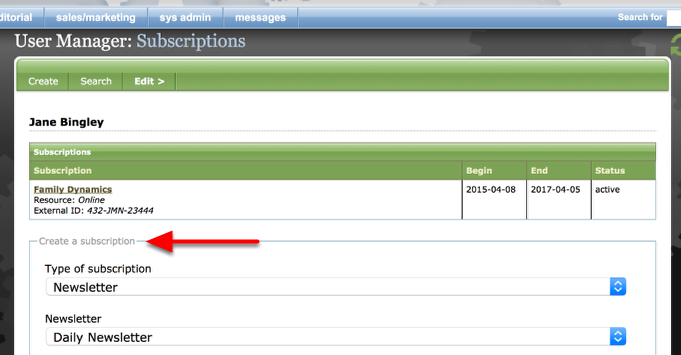 Access a reader's subscriptions in the User Manager under Edit > Subscriptions. To grant a user access to anything they purchased after a failed order transaction, we strongly recommend asking them to recreate the order themselves and pay through the shopping cart. Knowing that isn't always possible, the above allows you to help them access most of the products your website sells. If you want to discuss automatically sending orders to a third party in a specific file format or other efforts to integrate your customer service and third-party vendor order fulfillment processes or your internal fulfillment processes, please contact your project manager. Prev: How do I find order transactions that failed? Next: How do you handle fraudulent orders?